Israel is endangered today as it has never been before. The Turkish-Hamas flotilla two weeks ago precipitated a number of dangerous developments. Rather than attend to all of them, Israel's leadership is devoting itself almost exclusively to contending with the least dangerous among them while ignoring the emerging threats with the potential to lead us to great calamities. Since the Navy's lethal takeover of the Mavi Marmara, Israel has been stood before an international diplomatic firing squad led by the UN and Europe and supported by the Obama administration. Firmly backed by European and largely unopposed by Washington, the UN is moving swiftly towards setting up a new Goldstone-style anti-Israel kangaroo court. That canned tribunal will rule that Israel has no right to defend itself and attempt to force Israel to end its lawful naval blockade of Hamas-controlled Gaza. 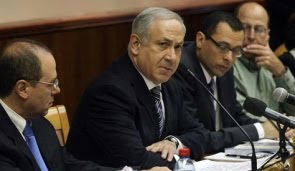 Fearing this outcome, Prime Minister Binyamin Netanyahu bowed to US President Barack Obama's demand that Israel set up an Israeli inquest of the Mavi Marmara takeover and permit foreigners to oversee its proceedings. Netanyahu also agreed to scale-back Israel's blockade significantly, and allow international bodies to have a role in its far more lax enforcement. Netanyahu has made these concessions with the full knowledge that they will strengthen Hamas in the hopes that they would weaken the international onslaught against Israel. Unfortunately, it took no time at all to see that his hopes were misplaced. Even before Netanyahu announced these concessions, UN Secretary General Ban Ki Moon already announced that they make no difference to him or to his friends in Washington and Brussels. They will move ahead with their plans to appoint a new kangaroo court charged with asserting that Israel has no right to defend itself. Recent statements by the leaders of Iran, Turkey, Syria, Hamas and Hizbullah make clear that the members of the Iranian axis view the Mavi Marmara episode as a strategic victory in their ongoing campaign against Israel. The international stampede against Israel at the UN, the White House and throughout Europe exposed Israel's Achilles heel. The Mavi Marmara demonstrated that on the one hand the IDF cannot enforce its blockade of Gaza without the use of force. On the other hands it taught Israel's enemies that by forcing Israel to use force, Iran, Turkey and their allies incited a UN-EU-US lynch mob against Israel. Iran, Turkey, Syria, Hamas and Hizbullah are moving rapidly to exploit their new discovery. In the very near future, Israel will face off against Iranian, Lebanese, and Turkish ships complemented by ships full of Israel-hating German Jews and other Jewish and non-Jewish Hamas supporters. The Mavi Marmara showed Iran and its allies that they can win strategic victories against Israel by giving the IDF no option other than using force against them. This means that Israel can bank on the prospect that all the ships they are dispatching will be populated by suicide protesters. Indeed the Iranians have openly admitted this. Mohammad Ali Nouraee is one of the regime officials involved in dispatching the Iranian ships to the Gaza coast. In an interview this week with Iran's official IRNA news agency Nouraee said that the passengers aboard the ships, "are willing to become martyred in this way." The Lebanese ships are being organized by Hizbullah-affiliated individuals and the Turkish ships are being organized by the IHH terror group that organized the Mavi Marmara. Hizbullah's penchant for dispatching suicide squads is of course well known. And the IHH showed its devotion to suicide protests on the Mavi Marmara. So it is fairly clear that the passengers aboard the ships from both countries intend to force the IDF to kill them. The intensification of the suicide protest campaign against Israel is dangerous for two reasons. First, it is a model that can be and in all likelihood will be replicated on air and land and it can be replicated anywhere. Israel can and should expect mobs of suicide protesters marching on Gaza to force Israel to surrender control over its borders. Israel can expect mobs of suicide protesters marching on Israeli embassies and other government installations around the world in an attempt to increase its diplomatic isolations. Iran and its allies have found a weak chink in Israel's armor. They will use it any way they can. Israel needs to quickly develop tactics and strategies for contending with this. The second and far more dangerous implication of Israel's enemies' aggressive adoption of suicide protests is that by ensuring violence will be used, they increase the chances of war. Indeed, Iran and its allies clearly believe that suicide protests are a vehicle for initiating a full-scale war against Israel on what they view as favorable footing. According to Bahrain's al Wasat press service, Hussain Amir, Iran's ambassador to Bahrain threatened this week that, "If the [Zionist] entity dares to direct any aggressive attack [against the Iranian ships] then it is certain that [Israel] will be met by a much stronger and firm blow." Obviously the most disturbing aspect of the war threats is the specter of Turkish naval vessels attacking the Israeli navy. If Turkey - a NATO member - participates in a war against Israel, the repercussions for Israel's relations with NATO member states, including the US, as well as the EU are liable to be unprecedented. While going to war against Israel would be a major gamble for Turkey, in recent years it has not shied away from high stakes challenges to its NATO allies. Indeed, one of Turkey's ruling AKP party's first actions upon taking power in 2003 was to deny the US military the right to invade Iraq from its territory. The deleterious impact of Turkey's refusal to come to the aid of its NATO ally at the time has been felt by US forces in Iraq ever since. In the days and weeks to come, Israel's political and military leaders must move resolutely to prepare to withstand these new threats that have arisen in the aftermath of the Mavi Marmara episode. To meet the expected deluge of suicide protesters on sea, land and air, Israel must immediately acquire non-lethal means to disperse these protests. This involves purchasing and producing tear gas, water cannons, rubber bullets and other non-lethal weaponry. These non-lethal weapons must be rapidly distributed to IDF units deployed along the frontier with Gaza and to the Navy. They must also be supplied to Israeli security teams tasked with protecting government installations worldwide. Forces must undergo intense and immediate training in crowd control and mob dispersal to be ready to meet what is clearly on the way. Diplomatically, Israel needs to hold its new line on the Gaza blockade. Netanyahu's buckling to US-EU-UN pressure has encouraged them to redouble their assault on Israel. The new line must be held at all costs. Otherwise, Israel will have no diplomatic line of defense as the approaching threats become reality. Strategically, our leaders need to consider what our aims will be in the coming war. For instance, as far as Turkey is concerned, Israel's aim will be to end the war as quickly as possible. Here the tools of diplomacy with NATO members and public diplomacy with the American people will be crucial to convincing Turkey to stand down. They must be aggressively and energetically utilized without delay. As for Iran, Israel's aim must be to prolong the war as long as necessary to secure its strategic objective of denying Iran nuclear weapons. Moreover, it is important to use both kinetic and non-kinetic means to change the relative power balance between the Iranian people and the Iranian regime. While in all likelihood today the Iranian opposition green movement is unable to overthrow the regime, if Iran initiates a war against Israel, Israel must use the opportunity the war affords to change that balance of power. Once Israel's political and military leaders determine the strategic goals of a regional war, they must move swiftly to outfit and train the IDF to fight it. This war will certainly be different from its predecessors and Israel's strategic goals - and the clear strategic and tactical preferences of its enemies - dictate the training that the IDF must initiate immediately. The longer term lesson of the Mavi Marmara incident, and the threats that emerged in its wake is that war is too serious a subject to leave to generals. The IDF and the Defense Ministry clearly misunderstood the nature of the threat posed by the Turkish-Hamas flotilla. Indeed, recent reports indicate that until the Mavi Marmara Israel wasn't even collecting intelligence on Turkey despite its obvious, multiyear transformation from ally to enemy underlines the fact that the IDF is woefully incapable of assessing, understanding and preparing for the threats Israel faces. In light of the IDF's failure to understand Turkey's transformation from ally to enemy in a timely manner, its incompetent planning for the takeover and its problematic performance in both Operation Cast Lead and the Second Lebanon War, Netanyahu must create an external body empowered to assess and dictate the means for preparing for emerging threats. This body can either be a new department in the Prime Minister's Bureau or the National Security Council can be empowered to perform this function. While this is not the most urgent matter on the national agenda, the establishment of such a body should be a central mission of the government.